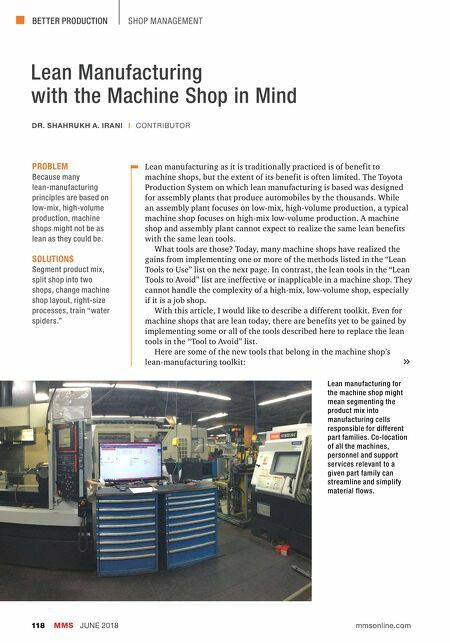 BETTER PRODUCTION MMS JUNE 2018 118 mmsonline.com SHOP MANAGEMENT Lean Manufacturing with the Machine Shop in Mind Lean manufacturing as it is traditionally practiced is of benefit to machine shops, but the extent of its benefit is often limited. The Toyota Production System on which lean manufacturing is based was designed for assembly plants that produce automobiles by the thousands. While an assembly plant focuses on low-mix, high-volume production, a typical machine shop focuses on high-mix low-volume production. 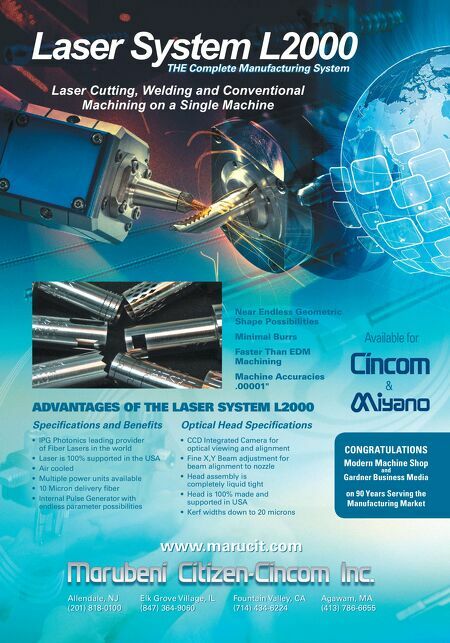 A machine shop and assembly plant cannot expect to realize the same lean benefits with the same lean tools. What tools are those? Today, many machine shops have realized the gains from implementing one or more of the methods listed in the "Lean Tools to Use" list on the next page. In contrast, the lean tools in the "Lean Tools to Avoid" list are ineffective or inapplicable in a machine shop. They cannot handle the complexity of a high-mix, low-volume shop, especially if it is a job shop. With this article, I would like to describe a different toolkit. Even for machine shops that are lean today, there are benefits yet to be gained by implementing some or all of the tools described here to replace the lean tools in the "Tool to Avoid" list. Here are some of the new tools that belong in the machine shop's lean-manufacturing toolkit: PROBLEM Because many lean-manufacturing principles are based on low-mix, high-volume production, machine shops might not be as lean as they could be. SOLUTIONS Segment product mix, split shop into two shops, change machine shop layout, right-size processes, train "water spiders." DR. SHAHRUKH A. IRANI | CONTRIBUTOR Lean manufacturing for the machine shop might mean segmenting the product mix into manufacturing cells responsible for different part families. Co-location of all the machines, personnel and support services relevant to a given part family can streamline and simplify material flows.